Bio: InsaneJ, or J as he's often called joined DOM's server when it was still hosted on Beastnode. He started hosting the Vanilla server on his own hardware and registered the happydiggers.net domain. Soon after that the forums were moved to this domain and a lot of servers were added to the HappyDiggers server list. After donations dried up the Towny server on Beastnode was closed down and J's server was the only one remaining. It currently hosts 11 different Minecraft servers. J spends his days maintaining the Minecraft servers and can often be seen on the FTB server. Apart for the server stuff he also tries to keep the HappyDiggers community running by managing the staff and facilitating new server projects. 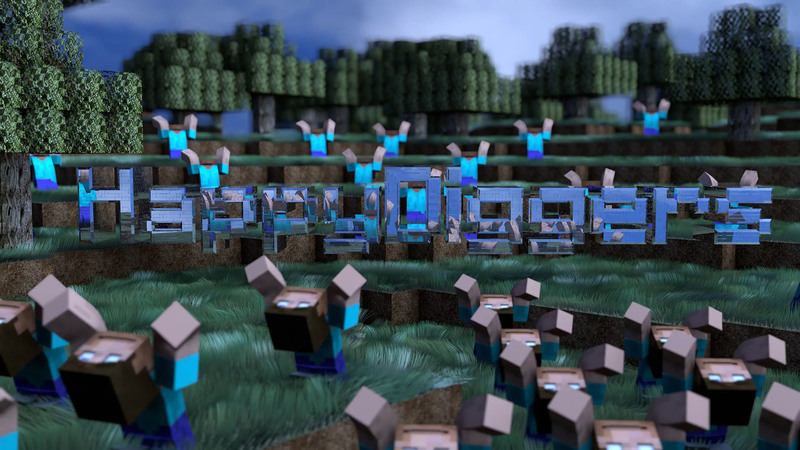 Recently J has started making the HappyDiggers AMP pack and took over development of the HappyDiggers RPG pack. Bio: DOM is my name, Minecraft is my game. I have played Notch's gift to the world since Alpha (when it was much cheaper). The game was suggested to me from some random guy in one of my Macro Economics classes (if you can, avoid that class). DOM stands for "Da Ork Masta", the gamertag that I use on every community I join. I am a full time Engineering student aspiring to be a professor and a part time Lead at my job. Quite a long time ago, I started to watch some tutorials on YouTube for Minecraft Beta and came across some Let's Plays that I still watch today. I became very interested in a specific YouTuber, Etho, and was driven to make videos and inventions like him. I started recording my first videos a couple of years ago and still record today. This community started from an idea that I had one late night (probably sleep deprived) to start up a server for my viewers to play on with me. On one of my "Subscriber Special" videos I introduced the first public server for our community. My goal was to get a large following and play vanilla Minecraft un-moderated. This community grew into what we have today, HappyDiggers. Today I mostly play on the servers in my spare time. I try not to get too involved in the projects of this community, but work behind the scenes to plan, fix, config, and program the various servers and plugins. This role inspired me to make the HappyGuilds plugin. Bio: I've heard a lot of stories about minecraft from people last year, but never considered to play 'the blocky game with huge pixels'. That is untill J convinced me FTB was awesome and something I would probably like very much as well. So it came to be that at the end of January 2013 I tried vanilla single player for an evening, then a week later bought it and started playing on the FTB server. I haven't played much other games since So far I haven't played on servers other then happydiggers' FTB yet, but that will probably change soon. Before actively joining this community early 2013, I have been involved behind the scences in setting up and managing linux on J's servers since the early 2000's when we played some Warcraft II with the old IPX network protocol tunneled by our 2 Linux servers over the big bad internet. I work in the IT (also mainly with Linux) and studied Electrical Engineering before that. Bio: I don't know who you are. I don't know what you want. If you're looking for fruit trees, I can tell you I don't have any... but what I do have are a very particular set of skills. Skills I have acquired over a very long career. Skills that make me a nightmare for people like you. If you follow the rules I will let that be the end of it. I will not look for you, I will not pursue you... but if you break the rules, I will look for you, I will find you... and I will ban you. Bio: Hello, my nickname was given to me by my buddy’s from when I was in the service. I have been a gamer since the Commodore 64 days. Have played a wide variety of games in my time. Mostly enjoy fps games when working with a clan, & open world games as Fallout 3, Skyrim, & Minecraft. My son got me to try out Minecraft a few years back. Played it a bit & didn’t get into it much. Heard about mods for it & saw the TFC survival mode as it should have been & haven’t looked back. Have been into TFC since around build 68. Have seen quit a few servers come & go. Found HappyDiggers looking for a new place, & really like the staff & how well the rules are enforced. I think online games with other people make the games. Now he is still a member of this community (and you just realized that by reading all this) being known as the Silent and Deadly weapon that terminates every villainous players on his way. IF you want to mess the servers just give a shout and consider yourself out of existence. Bio: Hello! My In Game Name is Legendair968! I play video-games... I think? I also enjoy listening to music, as well as making it! I try to play a different variety of games, but I tend to stick to the same series of games like Zelda, Pokemon, Halo, and some others. I enjoy listening to all styles of music as long as they are upbeat (tempo wise) and that goes the same with playing music. My main instrument is Trombone, but I love to play other instruments as well. I am always progressing with my music capabilities whether that be getting better at an instrument or learning to play a new one! Bio: After fourteen years as a multi-platform enterprise systems admin and systems automation/data migration programmer, I left my career in technology to pursue what I enjoy, and now run a small fishing charter company in my little hometown on the inside west coast of British Columbia, Canada. I hunt, fish, tan hides, build stuff, fix things and have a keen interest in survival, which is probably why I'm drawn, if not somewhat addicted, to TFC. :P See you on the servers! Bio: Is a typical Schroedinger-type moderator. Constantly resides in a quantum superposition, being both a mod and a lazy coach potato, making it impossible to find out which one it is now until been poked. Tears time-space continuum in proximity, producing lengthy posts and making any interaction infinite in defined time. Sometimes spawns projects, carrying the same superposition state. Enjoys writing similarly undetermined texts. All that might become instantly determined when his box been opened, which is unlikely, since Mother Russia guards him well with mighty bears on unicycles. Bio: Vikusha was simply wandering around until she found Terrafirmacraft server hosted by Happydiggers community, excited she joined the fun in raising animals, and surviving the dangers from mean creatures. She loved gathering flowers around the lands of Terarirmacraft. Not only did she like the mod, she also liked the server rules and how the owner and the staff manages them. After Terrafirmacraft, Vikusha discovered Ark from HappyDiggers, and decided to try a new challenge and experience the fun in taming dinosaurs, and grow with community that plays on the HappyDiggers servers. Although there is no wild flowers collecting like in Terrafirmacraft, but the experience it can give is enjoyable and so much more. Vikusha is happy to be part of HappyDiggers community, and hopes they live long and grow strong. Bio: I started gaming with Diablo/Warcraft 1 back when they were new..... migrated to Everquest for oh 8+years. Jumped on the Horde ship for WoW at launch for another 8 years, mistakenly choosing a pvp server weeee that was fun. Minecraft was a present kinda to myself but my wife was gonna get it for me. I tend to ruin all my surprises that way lol. While not playing I work at a call center and run the production floor while assisting staff with computer/program issues. Walking 3-5 miles a day for 10 hours means I play games a lot. Been married 7 years, lived with her for roughly 10 and known her for 16ish years. My Character name is actually the second evolution of characters name from EQ->WoW, as well as 2nd main character.